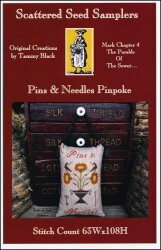 Pins & Needles Pinpoke [D7147] - $12.00 : Yarn Tree, Your wholesale source for cross stitch supplies. Cross stitch pattern by Scattered Seed Samplers. Know somebody who likes sunflowers? This would be a great design for them! This pinpoke features a pot of sunflowers growing. The sunflowers each of a bird standing on top of the flower. "Pins &," is stitched at the top & "Needles," is stitched at the bottom. Stitch count 63w x 108h. Stitched on #3630 Zweigart Edinburgh Linen Summer Khaki.